The Relay Computers and the life of George Stibitz had already been examined in other sections of this site. Here we will pay attention only to his pioneering work in the field of remote access to a computer. 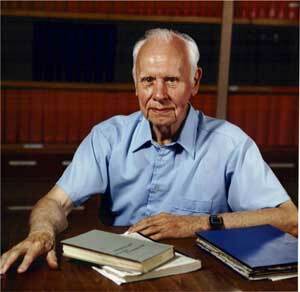 In the end of 1937, George Stibitz, then working at Bell Labs as a research mathematician, started to develop his first relay-based calculator. After completion of the designs in February 1938, in April 1939 began the construction of the machine. The leading engineer was Samuel Williams, a switching engineer in Bell Labs. The final product (called Complex Number Calculator, later renamed Model I Relay Computer) was ready in October, 1939, and was first put into operation on January 8, 1940. The calculating unit (processor) has 4 registers and is completely separated from the input/output unit, which is a special terminal (see the nearby photo). The computer itself was kept in an out-of-the-way room in the labs, where few ever saw it. 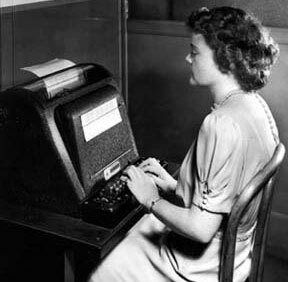 The operators accessed it remotely, using one of three modified teletype machines (see the nearby photo), which consisted of a keyboard and a printing device, connected to processor by a multiple-wire buss and placed elsewhere, which however cannot work simultaneously. Stibitz developed further the idea of remote, multiple access to a computer. 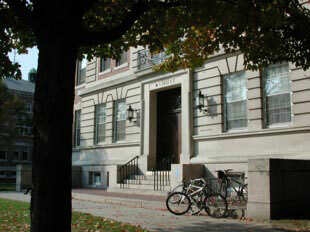 On September 11, 1940 the American Mathematical Society met at Dartmouth College in Hanover, New Hampshire (see the lower photo), a few hundred miles north of the building of Bell Labs in New York, where was the Complex Number Computer. Stibitz arranged to have the computer connected by telephone lines (using 28-wire teletype cable) to a teletype unit, installed there. It was the first computing machine ever used remotely over a phone line. The Complex Number Computer worked well, and there is no doubt it impressed those who used it. The meeting was attended by many of America's most prominent mathematicians, as well as individuals who later led important computing projects (e.g., John von Neumann, John Mauchly, G. Birkhoff and Norbert Wiener). Later on George Stibitz remembered (in his article "Early Computers", published in A History of Computing in the Twentieth Century, ed. N. Metropolis, J. Howlett, and Gian-Carlo Rota, New York, 1980): "In September 1940, after several months of routine use at the Laboratories, the computer was demonstrated at a meeting of the American Mathematical Society held at Dartmouth College, in Hanover, New Hampshire . . . I gave a short paper on the use and design of the computer after which those attending were invited to transmit problems from a Teletype in McNutt Hall to the computer in New York. Answers returned over the same telegraph connection and were printed out on the Teletype." "IN THIS BUILDING ON SEPTEMBER 9, 1940, GEORGE ROBERT STIBITZ, THEN A MATHEMATICIAN WITH BELL TELEPHONE LABORATORIES, FIRST DEMONSTRATED THE REMOTE OPERATION OF AN ELECTRICAL DIGITAL COMPUTER. STIBITZ, WHO CONCEIVED THE ELECTRICAL DIGITIAL COMPUTER IN 1937 AT BELL LABS, DESCRIBED HIS INVENTION OF THE "COMPLEX NUMBER CALCULATOR" AT A MEETING OF THE MATHEMATICAL ASSOCIATION OF AMERICA HELD HERE. MEMBERS OF THE AUDIENCE TRANSMITTED PROBLEMS TO THE COMPUTER AT BELL LABS IN NEW YORK CITY, AND IN SECONDS RECEIVED SOLUTIONS TRANSMITTED FROM THE COMPUTER TO A TELETYPEWRITER IN THIS HALL."